Additional Requirements: Must be a member of Silver Wolf. Must be C-Rank or above. If the job is taken as a group, at least one participant must be of C-Rank or above. A maximum of four players can take this job. At least one participant must have completed Basic Language Class, the previous job in the sequence. Sit through the lecture without falling asleep. Job Description: The linguist has returned and is offering an advanced language class in the language that guild members have previously studied. Hopefully participants have studied in the interval since the last class because this course will be more difficult. Since the course is an advanced one, players are encouraged to add more detail to their chosen language. It is strongly suggested to have studied before this class since there will be questions on the subject matter. If participants want to add a little more flavor, the questions can be asked in the language they are studying. Taking notes is optional. However, it is suggested that participants take notes on the lecture since the subject matter goes a little more in-depth this time. Enemies: N/A. Like last time, participants must stay awake during the lecture, which is lengthier and more detailed than last time. Reward: C-Rank EXP, 10K Jewels, and access to Expert Language Class, the next job in the sequence. Job is repeatable for each language a participant wants to gain advanced proficiency in. Participants also get another study packet; it is strongly suggested to study for the next class! Wearing her green-and-gold outfit and Argent Gloves, Leona was in her office studying the Court Heiromesh packet given to her by Professor Rosetta a few days ago. She was trying to take her mind off of what she had discovered in some ruins only a few miles from Nebdoui. After a harrowing underground adventure she discovered a book whose pages were made of solid gold and whose contents were written in Court Heiromesh, a language that she was studying because it was the language of ancient Desierto. Knowledge of the language had come in handy during the exploration because the blonde was able to decipher clues that kept her from getting a steel dart through the top of the head or becoming mummified crocodile food. Realizing that she would not always have her mother to write up a handy guide scroll, Leona was determined to continue studying the language so that she could learn it for herself. However, studying the packet was not easy because the Guild Master had not gotten any news from Nebdoui since that adventure. Either the village was doing just fine or the heads of its residents were now decorating pikes left in the smoldering ruins. Leona did not have much time to worry about her home because there was a knock on her office door. "Come in." Leona bade the person standing on the other side of the door. An older staff member entered and spoke to her. 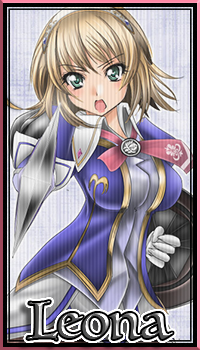 "Guild Master, Professor Rosetta is here to teach your advanced language class in Court Heiromesh. He's waiting for you in the guild library." The staff member informed Leona. The blonde stood up and pushed her chair back under her desk. She then gathered a notebook and some pens and pencils in preparation for today's class. "Thanks. Please tell him that I'm on the way." Leona requested. The staff member nodded and left, closing the office door behind him. Leona was not too far behind. She put the translated contents of the golden book into her desk and closed the office door with her foot, then hurried to the library with supplies in her arms. She was about as ready for the lengthy lecture as she was going to be. "Ah, so good of you to join me for another class, Miss Jarnefeldt." Professor Rosetta said to the Silver Wolf Guild Master. Leona set her notebook of paper and pens and pencils in front of her before greeting the professor. "I'm glad you're teaching the class, Professor Rosetta." Leona expressed her appreciation to the white-haired scholar clutching an armful of books with bookmarks of different colors sticking out of them. He set the books down on an empty table and walked over to the chalkboard. He took a stick of chalk into his slender fingers and began to write Court Heiromesh characters on the board. They were different from the normal characters in that they were slender and not nearly as wide and curved as the normal characters were. They also had dashes underneath for different pronunciations... at least that was what Leona thought they were for, anyway. "Today you'll learn how to write Court Heiromesh as well as speak it. The written form's fairly complex and not for beginners, but you're no longer a beginner student." The elderly scholar said to her. He then launched into his lecture on the subject without further discussion or preamble. "The writing system of Court Heiromesh is an ancient system that's not in use anywhere else in the world. Just like with the spoken form of the language, the written form of Court Heiromesh was deliberately kept complex because it took so long for scribes to learn. It was meant to preserve the prestige of the scribes and nobility." Professor Rosetta explained to Leona. Leona was not particularly impressed by the decision of the ancients to make and use a complex writing system when a simpler one would have worked a lot better. Then again, the blonde was no scholar. She was a simple sort who fought and explored instead of studying languages and cultures. Even though it was a challenge, Leona was glad that she was taking the classes because they gave her a chance to expand her horizons and become something other than "dumb muscle." "Now if you'll follow along with me..." Professor Rosetta requested of his student. Leona was trying to stay awake through the lengthy lesson. Her notebook was filled with the letters of written Court Heiromesh and their modern language equivalents. She had trouble telling them apart, but in time she would learn how to because she would study the language. She did not want to be dependent on Professor Rosetta, her mother Sophia, or anyone else when it came to translating the language. Leona wanted to have at least one skill other than fighting. "Leona? Are you paying attention?" Professor Rosetta asked in Court Heiromesh. "I'm. I'm reading over notes I took." Leona answered in passable Court Heiromesh. She was kind of tired from the lecture and the constant scribbling on the chalkboard. The blonde had been fighting nodding off and did not always win. She had nodded off once or twice but thankfully did not completely go to sleep. She was ashamed of herself... the professor had come to the guild hall on his own time and Leona was spacing out because she was tired from a lengthy lecture. "Your grammar needs a bit of work, Miss Jarnefeldt. Still, you're making progress." He answered back before continuing the lecture. Leona was not sure whether that was praise or a backhanded insult. She counted her blessings because she expected the man to get angry and storm out after verbally berating her. She kept quiet and continued to listen while taking notes the best she could. "And that's the lesson for today. Now you'll need to study the packet for the Expert course of Court Hieromesh. That class will teach you to speak and write like a native of Desierto!" Professor Rosetta claimed to her. Leona could not help but to give him a blank look. Did he not realize that she was born in Desierto? "Anyway, you need to focus a little harder, but you're doing great. I'll see you next time!" He handed her the Expert-level study packet before bidding her farewell and exiting the library. Leona walked him to the door and saw him out. When the professor was gone, Leona returned to the library and grabbed her notebook, pens and pencils, and the study packet she had been given. She then retreated to her office. Leona had a lot of studying to do if she wanted to learn Advanced Court Heiromesh before her next trip to Desierto. The tired Leona was staring at her notebook and the study packet but was getting nowhere fast. She was just too tired to be able to make any sense of it, but she needed to study the material because she would be tested on it the next time she stepped into an ancient ruin in Desierto. Leona tried in vain to focus. She really needed to sleep after the lengthy lecture. She put her head on her desk and soon went to sleep. Leona peeled her face off of the wooden desk. Her face and her back felt awful from sleeping on the desk. She looked at the notebook and study packet and sighed. She felt like she had just wasted both the day and the professor's hard work in trying to teach her the language. She grimly closed the study materials and set them aside because studying right now was an exercise in futility. She would just have to try again another day when she was not so tired. Professor Rosetta tried his best to make the class engaging, but he had a monotone that just did not let up. The sheer length of the lecture did not do him any favors either. If the Advanced-level course was five hours, she dreaded seeing the Expert-level course. There could be a whole new generation of Wizard Saints and Gods of Ishgar by the time he finished giving the Expert-level lecture. That was an immature attitude to take and did not reflect well on a Guild Master, but it was the truth. Leona felt that the lectures dragged on too long and got bogged down in minutiae. Still, there was no doubt that the professor knew the material and did not lack for passion in attempting to teach it. All he needed to do was change his monotone and the course material could be rather interesting. Leona needed to step up to the plate and study the course material. She also needed to find a way to stay awake during the lengthy lectures that did not involve consuming enough coffee to fill the guild hall. Maybe she could speak to one of the senior guild staff in finding ways to stay awake. She would have to work on all of that later. Right now she just wanted to go to sleep. The blonde took the lecture material into her hands and went to her room to go to sleep. She did not get how someone could sleep slumped over with their face stuck to the top of the desk. She supposed that one did what they had to do.